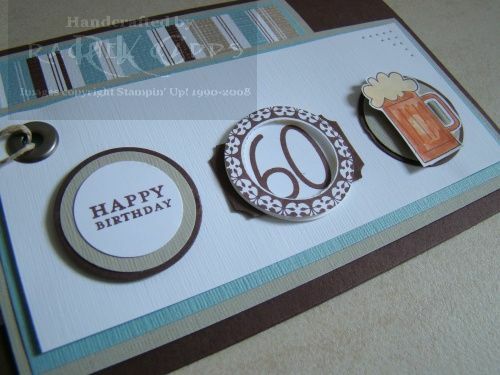 This is a card entirely inspired by Karen at Live, Laugh and Stamp here. 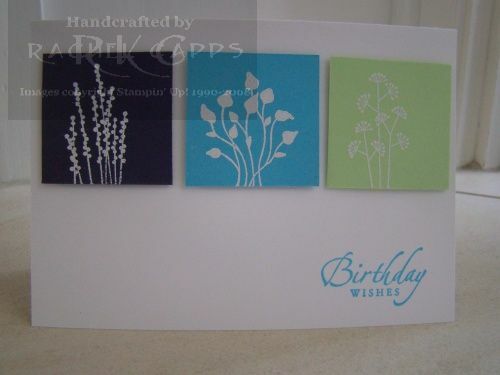 I’m a huge fan of Karen’s style, she adds a simple elegance to all her cards that I admire. Please check out her blog, I’m sure you’ll be inspired too! 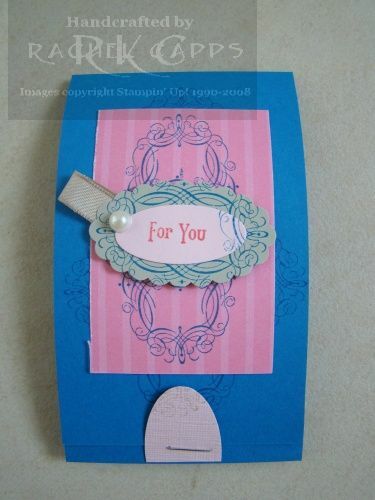 For this card I used the colours Green Galore, Bashful Blue and So Saffron and Rose Red. And I had to use textured Whisper White as well. The stamp set is Hello Again with the butterfly and Occasions for All for the sentiment. 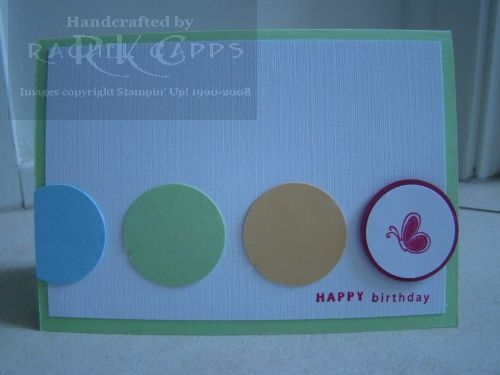 I’ve used my 1-1/4″ circle punch for the circles. These are the calendars I made as free gifts to all my guests who were kind enough to join me for my Sale-a-bration Summer mystery party. Thanks again to everyone who came along – it was lovely to create with you! I made these calendars with the Kaleidoscope DSP paper (available in the Summer Mini) and based the calendars around the colours from this bright DSP. So I based my gifts largely around the Bold Brights colour family, even though Kaleidoscope colours are Tempting Turquoise, Green Galore, Summer Sun, Only Orange, Pink Passion and Pixie Pink. 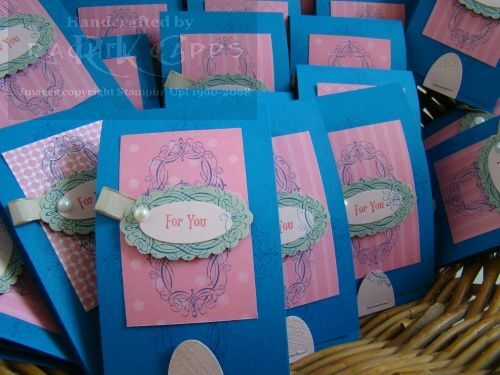 I really love this flower paper from Kaleidoscope! 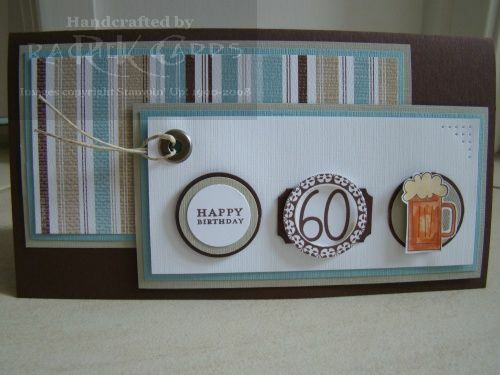 I also used the so so so versatile Sale-a-bration stamp set, Vintage Labels, for the calendars. This is my new favourite stamp set! If you too would like to own Vintage Labels, then email me today with your order over $100 and you can have it for FREE! Check out all the Sale-a-bration stamp sets you earn for FREE here – you only have to spend over $100 to earn one – NO LIMITS! These were some of the free gifts my guests received on Friday night at my Sale-a-bration & Summer Mini mystery hostess party. It was a great night and I’ll show you some more things we made and my other gift over the coming days. 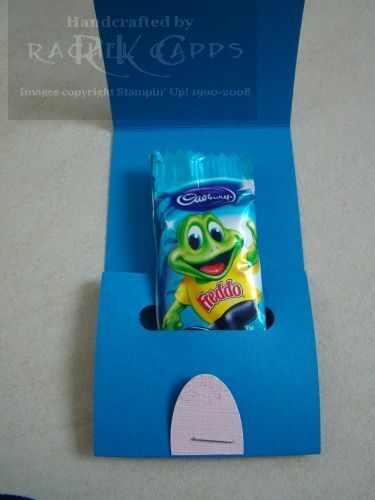 This is such a cute idea and it was inspired by my upline, Joanna Wassens, here. I’ve used the colours Pacific Point, Regal Rose and Pink Pirouette. 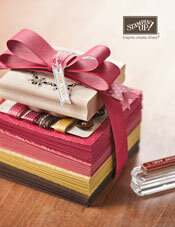 The Regal Rose paper is the DSP available only to hostesses as a Level 1 hostess gift. I stamped the frame and sentiment from the Sale-a-bration stamp set, Vintage Labels. And yummy – a Fredo inside! My Uncles turned 60 on the weekend. They’re identical twins, so I made their cards similiar, but different! This one I based on the Parisian Breeze DSP (retired). The colours I’ve used are Chocolate Chip, Sahara Sand, Baja Breeze and Whisper White. And this one I based on the Outlaw DSP (retired). The colours I’ve used are Chocolate Chip, Close to Cocoa, Creamy Caramel, Sage Shadow and Very Vanilla. 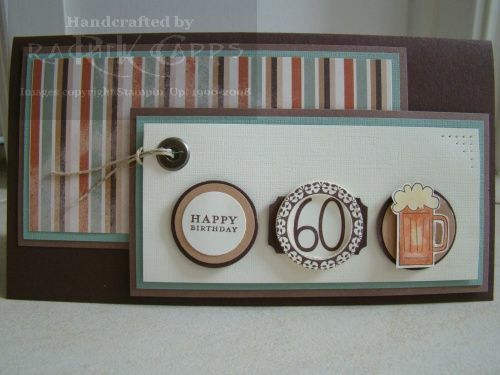 On both cards I’ve stamped the “Happy Birthday” and frame around the number 60 from the Sale-a-bration stamp set, Vintage Labels. 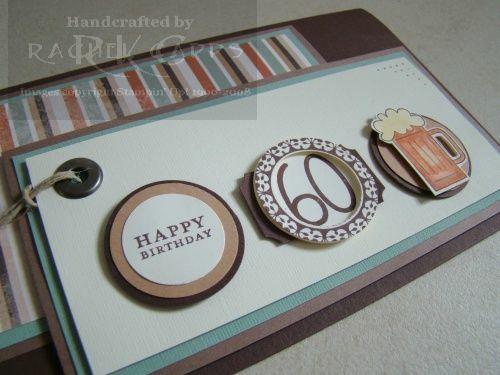 The “60” is from Best Friends Numbers (retired) and the beer mug is from Cheers to You. I finished off each card with a jumbo eyelet and linen thread.